The outcome is a unique product with a distinct flavor profile well situated within the Trappist family of Quadrupel ales. 11.2 oz. bottle. Mar 12, 2018 | By Paul C.
Rate these qualities (5 is the highest): Aroma 5, Appearance 5, Taste 5, Palate 5. I'm not a wine or beer snob bent towards detailed ratings. 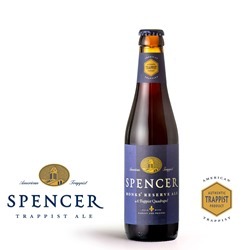 All I know is this SPENCER Quad has great body, mouthfeel, and taste. A big, delicious beer! As good as a Chimay Grand Reserve, or any other Quad from Belgium. Made right here in the USA!